GOV.UK Pay – the government’s secure online payment service – has now processed almost half a million payments, with a total value of over 20 million pounds, for central government service teams. We offer end users a GOV.UK-branded payment experience designed to meet their needs, with payments routed to multiple Payment Service Providers (PSPs). If you’re in a central or local government service team, you can try GOV.UK Pay now. For more information visit our product page, or get in touch with the team. Since our earliest blog posts about our work to make payments more convenient and efficient, we’ve heard from local government authorities keen to adopt GOV.UK Pay. Our colleagues over at GOV.UK Notify recently announced their private beta with local government. We’re now also ready to start a limited pilot with local government service teams. The pilot will help us understand how the needs of local government organisations differ from those of central government. For example, we’ve introduced custom branding on our payment pages for organisations that are exempt from GOV.UK branding requirements. Teams will still benefit from payment pages designed to meet the needs of paying users – fully accessible with helpful inline error messages and a user experience optimised for mobile. But for those who need it, we now offer a payment experience that can be made consistent with the rest of your online service. Anyone with a public sector email address can set up their own test account by visiting our new GOV.UK Pay product page and clicking on ‘See how to get started’. You can invite other members of your team to join your test service without any help from us. For teams wanting to use GOV.UK Pay, technical integration takes just a couple of days. Once you’ve finished a test integration we can easily and quickly switch over to your live service. Our test and live accounts are both run on the same infrastructure. Test accounts are free and unlimited, and you don’t need a contract with one of the underlying Payment Service Providers to try us out. 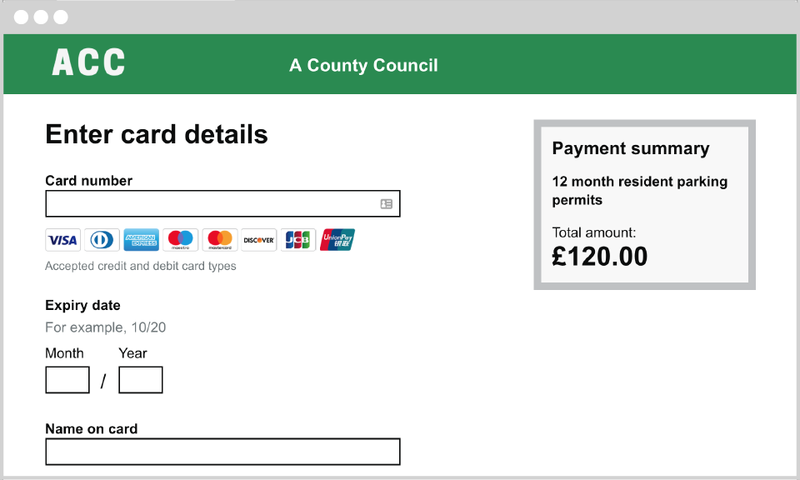 If you’re a local authority interested in taking online card payments using GOV.UK Pay, get in touch. Follow Till and Rory on Twitter. Sign up for email alerts to future GOV.UK Pay posts on the Government as a Platform blog.